The Windows 8 App Store has been creating a high buzz since the day Microsoft has announced its release. 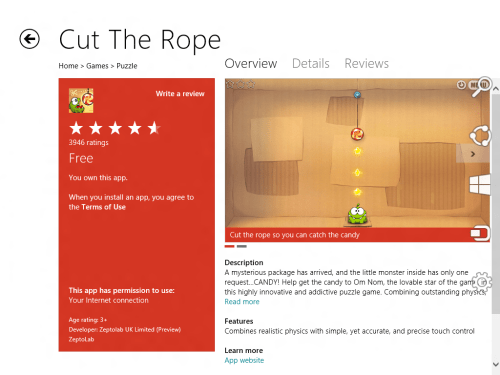 The App Store brings us bundle of amazing Windows 8 apps such as the very popular Cut the Rope, various news apps, and many more. The interface of Windows 8 Metro Style App Store is very much like the Android Play Store and the Apple iTunes Store. The apps are shown in metro style, in the form of tiles. In order to install an app, click over it. Check out our post on How To Install Apps in Windows 8. The Apps in the store has been categorized in various parts such as Spotlight, Games, Social, Entertainment, Photos, Music & videos, Books& reference, News & weather, Food & dinning, Shopping, and many more. The good part is that you will also get to see some amazing mobile apps on Windows 8 app store. All the best apps are revealed in Windows 8 app store which makes prominent and best apps. Most of the apps are ready to install and categorized in different categories which makes easy to search for any app in windows 8.. You can even check out apps for your XBOX. As you click on any app, the app gets directly installed to Windows 8 metro interface. Also, check out our post on Amazing Windows 8 Apps. Almost all the apps are free of cost. Allows to download interesting games like cut the rope. Provides social and entertaining apps. You can even check out latest music and videos. Choose among book and reference as it used to be in Google books. Check out news and weather apps in new metro style app. Customized categories like food, shopping, dinning, travel, finance and productivity. Earns out some productivity and security apps in windows 8 app store. 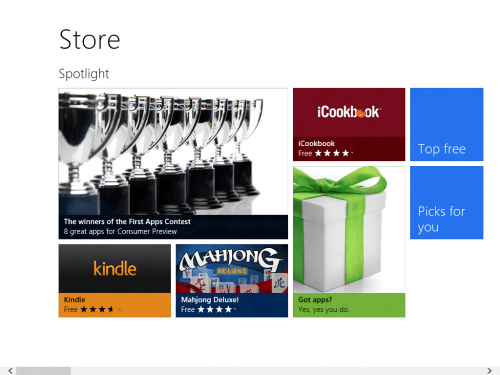 Windows 8 App Store is an excellent introduction to Microsoft’s OS. Go ahead try access it now.